“Scientists have been struggling for decades to free diabetics from regular insulin injections. One of the main goals has been to figure out how to transplant healthy beta cells – the insulin-producing cells that fail as a result of diabetes – into patients, but this is an invasive procedure in itself that comes with the risk of rejection. “Now researchers have come up with a simpler option – they’ve created a synthetic patch that’s covered in natural beta cells, which can be stuck painlessly to a patient’s skin to secrete insulin when it’s required and safely control blood sugar levels, no injection or monitoring required. “The patch hasn’t been tested on humans as yet, but it’s already been shown to safely control the blood sugar levels of mice for at least 10 hours at a time, and the concept is an upgrade of the ‘smart insulin patch’ that was reported last year by the same team. “The main difference is while the previous patch contained synthetic insulin, the new patch contains real, live beta cells, which means it’s able to more safely manage a patient’s blood sugar levels for longer, without the risk of over- or under-doing it. “And because the beta cells are kept on a patch safely outside of the patient’s body, there’s no chance of them being rejected by the immune system. “Beta cells are usually found in the pancreas, where they release insulin to help the body process excess sugar in the bloodstream following a meal. In people with diabetes, the cells are either damaged, or aren’t able to produce enough insulin to keep blood sugar levels under control, which is why regular insulin injections are required. “The new patch works by linking microneedles up to live, cultured beta cells. If that doesn’t sound too fun, don’t worry, the needles are each roughly the size of an eyelash, which the scientists say means they don’t hurt when they’re applied. “Those microneedles poke into capillaries and provide a link between the beta cells and a patient’s blood stream, and the team has developed something called ‘glucose-signal amplifiers’, which respond to rising blood sugar levels and communicate that message instantly back to the beta cells. “The patch has now been tested on mice with type-1 diabetes, and the researchers have shown that it can quickly respond to skyrocketing blood sugar levels, and keep them controlled for 10 hours at a time, without any monitoring or regulation. “Not only is this a whole lot quicker and easier than regular insulin injections, it’s also safer, because diabetics can often give themselves too little or too much insulin, which can lead to complications such as hypoglycaemia, blindness, comas, and even death. “To make sure that there was no risk of this happening with the patch, the researchers added a second patch onto mice that had already had their blood sugar levels regulated. As they’d hoped, the new patch didn’t produce any extra insulin, but it did extend the life of the treatment to 20 hours. “Before you get too excited, there’s still a long way to go before the device can hit the market. First, they patches need to be tweaked further to get the best performance in animal models, and will then need to enter pre-clinical tests, and eventually clinical trials in humans. “But all the evidence so far suggests that they might just work as an easy and safe way for diabetics to control their condition. And that’s something we really need. More Awesome Sauce from me, #buckroth! “Research has found a strong connection between diabetes and sleep issues. Diabetics often suffer from sleep loss. And sleep loss can increase the likelihood of developing diabetes and exacerbate the symptoms for someone already dealing with the disease. “Diabetes is a group of diseases in which the body is unable to properly produce and/or respond to insulin, resulting in too much sugar in the blood and urine. More than 30 million American adults have a form of diabetes and another 84.1 million are living with prediabetes – a condition that, without proper treatment, often leads to the development of Type 2 diabetes within five years. “Read on to learn more about the relationship between sleep, developing diabetes, and improving sleep with the disease. “Researchers have discovered many links between poor sleep and the development of onset, or Type 2, diabetes. Across the board, studies have shown that people who are considered “short sleepers” (those who sleep less than 5 hours a night) have an increased risk of developing diabetes. And these short sleepers also tend to have a lower than average glucose tolerance, even if they haven’t been diagnosed with or previously shown other symptoms of diabetes. “Other studies have linked a lack of sleep to insulin resistance – another common precursor to Type 2 diabetes. Insulin resistance is a condition in which the body’s cells do not respond normally to insulin. A case study presented at a meeting of the American Diabetes Society found that healthy young people who regularly slept for less than 6.5 hours a night had a higher occurrence of insulin resistance. By contrast, people who got more than 7.5 hours of sleep had a lower occurrence of insulin resistance. “A lack of sleep has also been connected to obesity – a condition which has been linked to the development and increased severity of diabetes. Researchers have shown that a lack of sleep can impair glucose metabolism and affect appetite regulation, making it more difficult for your body to control hunger or recognize satiation. In addition, the exhaustion someone feels when sleep deprived makes it difficult to exercise and control weight gain. Getting more than 7 hours of sleep a night is a key factor in preventing obesity and therefore containing the risk of developing diabetes. “Diabetics often struggle with a variety of sleeping problems. People will diabetes have a slightly higher reported rate of insomnia. That’s to be expected, as diabetes symptoms can make it more difficult to sleep and a lack of sleep can worsen diabetes symptoms. “Unregulated blood sugar and imbalanced hormone levels can make a good night’s sleep seem elusive. Having high blood sugar levels during the day often makes it difficult for the body to sleep effectively at night. And being tired makes it harder for the body to regulate blood sugar. “Those dealing with diabetes are also faced with a number of issues that can affect their comfort, especially while trying to sleep. Increased levels of blood sugar can cause neuropathic pain, which is an uncomfortable tingling or burning the fingers, toes, hands, and feet. Restless Leg Syndrome (RSL) affects a higher percentage of people with diabetes, another contributing factor to disrupted sleep. Apnea is another frequent cause of concern among diabetic sleepers. A wide variety of people struggle with sleep apnea – a serious disorder in which a person’s breathing is interrupted during sleep. Diabetics, especially those who are obese, are more prone to experience its symptoms. “There is an undeniable link between poor sleep and diabetes, as one tends to both aggravate and intensify the other. But managing to improve one also tends to make it easier to manage the other. “Eating correctly and properly maintaining blood sugar levels throughout the day makes it easier for the body to maintain the necessary levels throughout the night, often resulting in better sleep quality. Maintaining proper blood sugar levels can also reduce the symptoms of neuropathy and RLS. “In turn, more and higher quality sleep has been shown to decrease glucose levels and make diabetes symptoms easier to manage. T:he American Diabetes Association: The ADA is devoted to diabetes education, advocacy, and research. The organization’s website provides practical information as well as active message boards for adults with type 2 diabetes. Diabetes Self Management: This comprehensive site encompasses a wide-range of issues related to diabetes, from sleep management to nutrition and exercise. Defeat Diabetes Foundation: This unique site, founded by a senior citizen, marathon runner who is also an insulin-dependent diabetic, emphasizes that people with diabetes are neither “helpless nor hopeless.” The site has a strong focus on self-care. Academy of Nutrition and Dietetics: The nation’s largest organization of nutrition and food experts offers recipes, healthy eating tips and helpful advice for the general public, but the site also features many articles specifically related to diabetes and nutrition. “CDCDiabetes: The Center for Disease Control (CDC) has a dedicated diabetes handle, where they share updates, statistics, recipes and other interesting information. Diabetes Daily: You’ll get the latest in diabetes news, along with practical information for living daily life while managing your diabetes. TuDiabetes: This community of people touched by diabetes shares personal stories and educational links, with a goal to connect, empower and mobilize those affected by diabetes. Susan G. Weiner, RD: A nutritionist specializing in diabetes advocacy, Weiner shares tons of information about the dietary aspects of managing diabetes. “Blogs: Diabetes Stories: Riva Greenberg began blogging about her life as a diabetic as a way to share her own experience and knowledge in order to help others thrive. Her blog follows her journey and reflections as a diabetes advocate as well as research advancements and updates. Diabetes Forecast: This is the companion blog site to Diabetes Forecast magazine. 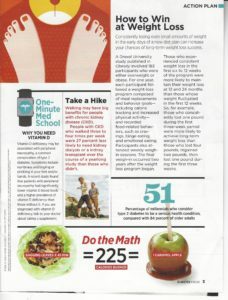 It focuses on healthy living, offering articles on food, exercise, and medications. There are also insightful interviews with public figures who are living with diabetes. diaTribe: diaTribe aims to help people make sense of diabetes by offering a wealth of outstanding information on living with disease. What is Up-and-Coming in Diabetes Technology? A new year is underway, and with that comes the emergence of advances in diabetes technology. Companies like Tandem, Dexcom, Medtronic, Insulet, and Senseonics are continuing to move forward with projects that have been in the works for several years, as well as new ones. They are constantly striving to improve how diabetes is managed and to enhance the quality of life for those living with the disease. Closed loop systems. Many companies are still working to refine these processes. It is difficult to create an effective system that requires no user interaction, but they are getting closer. Currently, they are focused on reducing the amount of user input necessary and turning to sensor technology to measure and track blood glucose levels, automatically dose according to individual needs, and predict glucose levels. No fully closed loop systems are expected to be released in 2018, however. Smartwatch and smartphone compatibility. Many people nowadays own smartphones and smartwatches. Companies are leveraging these connections to bring glucose monitoring right to people’s fingertips. With improved sensors and Bluetooth technology, data can be delivered directly to these devices through apps that allow for better tracking and monitoring of glucose levels. Users would also have the option of sharing this data with others, such as healthcare providers. There are a variety of apps in development with features to improve diabetes management. Improved sensors. Speaking of sensors, they’re changing too. Industry leaders are looking to make sensors smaller yet more effective and accurate. They are also trying to extend the length of wear and reduce the number of daily calibrations needed. In turn, this would allow individuals more freedom and require less interaction with these systems while still managing blood sugar. Increased FDA approval. There are some devices and technologies that are approved internationally but are not yet available in the United States. Or, approvals in the United States are stricter. International companies are looking to expand the availability of certain products in the U.S. and ensure that their diabetes care technology meets required standards. Overall, there are numerous collaborations occurring between companies within the diabetes vertical that could have a positive impact on how the disease in managed moving forward. Companies are working together to bring about more advanced technology and monitoring systems that will make it easier for individuals to track not only their glucose levels, but also insulin use, meals, activity, and other factors that impact their diabetes care – and share it with their healthcare providers. The Diabetes Research Connection is excited to learn more about these advancements in the months to come and see how diabetes care is changing for the future. The organization proudly supports novel research projects by early-career scientists and provides up to $50,000 in funding for studies. Learn more about current projects and how to support these initiatives by visiting http://diabetesresearchconnection.org. Thanks in part to funding from the Diabetes Research Connection (DRC), Dr. Kristin Mussar was able to conduct an in-depth study regarding how to stimulate the body’s own cells to create new insulin-producing cells that may help treat type 1 diabetes (T1D). In individuals with T1D, the immune system attacks insulin-producing cells, destroying them and leaving the body unable to effectively regulate blood sugar. The human body is filled with myeloid cells that all differentiate to help grow, maintain, and repair various organs. When these cells are depleted, it impacts organ health. For instance, lack of insulin-producing cells results in diabetes. However, Dr. Mussar and her team discovered that there is a population of macrophages – white blood cells that recirculate throughout the body constantly monitoring the health status of all tissues – that instruct insulin-producing cells to grow in the perinatal stage of pancreas development. During this period of prolific growth, enough insulin-producing cells are created to support glucose homeostasis throughout one’s life. Dr. Mussar found that there is a special population of these cells that act as cargos of potent growth factors for the insulin-producing cells in the pancreas. If these cells are prevented from entering the pancreas, the growth of insulin-producing cells is arrested and diabetes ensues. This lack of cell growth, as well as cell destruction, are issues that researchers have been trying to remedy through various strategies for treating T1D. One avenue of treatment that is being explored is finding ways to use the body’s own cells and processes to support insulin production. Current challenges in treatment include the constant monitoring and accurate dosing of insulin, as well as the use of immunosuppressants or other medications to prevent the body from destroying modified cells or specialized therapies. Using the body’s own cells can help reduce risk of immune attack or rejection. To this effect, Dr. Mussar’s research revealed that there are precursors to these special macrophages that exist within the bone marrow of adults. When these precursors are injected into the blood stream, they are able to signal growth of insulin-producing cells. This discovery raises hopes that, by dispatching these pro-regenerative cells from the bone marrow to injured pancreatic islets, it may be possible to enhance regeneration of insulin-producing cells in individuals with type 1 diabetes. This may in turn help to stabilize blood sugar naturally using the body’s own cells. The Diabetes Research Connection is proud to have played a role in making Dr. Mussar’s research possible by providing funding that enabled her to continue moving forward with her project and eventually get the results published in the Journal of Clinical Investigation. Healthy adults can typically recognize when their blood sugar may be becoming too low. It triggers physical symptoms such as dizziness, sweating, weakness, and rapid heartbeat, just to name a few. Plus, their body responds by producing glucose and initiating the brain to signal for food. However, in individuals with type 1 diabetes, the brain does not always respond in this way. A recent study found that the areas of the brain activated by low blood sugar in adults without diabetes are not the same as those in adults with type 1 diabetes. In brain scans of non-diabetic adults, areas associated with reward, motivation, and decision making showed changes during brain scans. However, only half of the individuals with T1D experienced similar changes, and only in one area of the brain – the area associated with attention – and the other half experienced no changes. Their brain showed no noticeable response to having low blood sugar, which is why individuals may miss cues that others would typically pick up on. According to Janice Hwang, M.D., assistant professor of medicine and first author on the study, “There is a progressive loss of coordinated brain response to low blood sugar as you go from healthy adult to aware to unaware. The first areas of the brain to go are associated with feeding behavior.” The researchers are hoping that these findings will lead to more effective ways of restoring low blood sugar awareness in individuals with T1D who have lost this awareness. It is these types of discoveries that help to improve understanding of how T1D affects the brain and body and allows researchers to develop more effective ways of treating and managing the condition. The Diabetes Research Connection supports early career scientists striving to advance research regarding the treatment, prevention, diagnosis, and management of T1D. Researchers can receive up to $50,000 in funding to apply toward their project. To learn more or support these efforts, visit http://diabetesresearchconnection.org. Small pamphlet-type magazines, such as the quarterly Diabetes Focus hold lots of helpful, healthful, informative information concerning T1Ds and T2Ds. For instance, I re-wrote four short articles from the Fall/Winter 2017 edition with its appropriate picture, shown below. 1.) How to Win at Weight Loss “Consistently losing even small amounts of weight in the early days of a new diet plan can increase your chances of long-term weight loss success. “A Drexel University study published in Obesity involved 183 participants who were either overweight or obese. For one year, each participant followed a weight-loss program composed of meal replacements and behavior goals – and recorded food-related behaviors, such as cravings, binge eating, and emotional eating. Participants also attended weekly weigh-in sessions. The final weigh-in occurred two years after the weight loss program began. Those who experienced consistent weight loss in the first six to 12 weeks of the program were more likely to maintain their weight loss at 12 and 24 months than those whose weight fluctuated in the first 12 weeks. Interesting, right? I was not a part of this story, but want to share it with you. Wait, there’s more…. Simply put, M O O O V E! Have you ever heard of this, this…”Ankylosing Spondylitis?” Did I spell that correctly? Anyway, no, I never heard of it either. Having seen and read this article written by Linda Andrews [whom I have never heard], I came to this sharing conclusion: You must read this…. Ankylosing spondylitis is a form of arthritis caused by inflammation of the joints. Patients often begin experiencing painful symptoms in early adulthood, including aches and stiffness in the lower back and hips. These are often the worst after periods of inactivity or immediately after waking up. Unlike typical back pain one might experience from injury or spending too many hours in a chair, ankylosing spondylitis can affect other joints, particularly joints in the spine at the lower back and pelvis. The hip and shoulder joints can also be affected as well. The vertebrae in the back are of particular concern because, if left untreated, these joints can fuse together. This can cause a person to have a hunched over posture and may affect a person’s ability to breathe. While many patients endure these painful symptoms for up to 10 years before receiving a proper diagnosis, those who work with their doctors to find proper treatment experience a much greater quality of life. Experts agree that ankylosing spondylitis and other related diseases can run in families, so if you have relatives with a history of immune problems, you may be more likely to develop ankylosing spondylitis. If you’re experiencing lasting pain for more than three months that feels worse in the morning and better with movement, you should talk to your doctor about ankylosing spondylitis as the potential cause of your symptoms. Your doctor will perform a physical exam and ask you about your symptoms and whether you have a history of injuries in the affected joints. Your doctor may order imaging tests, such as an X-ray or MRI, to get a better look at what’s causing your pain. You can also expect a simple blood test to check for signs of inflammation, as well as to rule out other potential illnesses. Your family doctor may initially diagnose you with inflammatory back pain, and refer you to a rheumatologist, a doctor who specializes in medicine related to joints and autoimmune diseases. As ankylosing spondylitis is not associated with mechanical issues that occur with injury-related back pain, it cannot be simply remedied with surgery and requires other therapies. While scientists continue to look for a cure for ankylosing spondylitis, there are many effective therapies that can relieve pain, improve dexterity, and delay advanced complications, such as joint damage. Doctors often rely on drugs to reduce the painful and destructive joint inflammation with ankylosing spondylitis. These include nonsteroidal anti-inflammatory drugs, known as NSAIDs, and TNF, or tumor necrosis factor, blockers. TNF blockers are part of class of medications called biologics that suppress aspects of the body’s inflammatory response and may slow the progression of ankylosing spondylitis. Many patients also benefit from regular exercises with a physical therapist. Patients often find that stretching and rage-of-motion exercises, such as yoga or pilates, can help relieve pain, increase flexibility in joints, and improve physical strength. Ankylosing spondylitis may be a lifelong condition, but it doesn’t have to be a life-limiting one. Working closely with your doctor about latest treatments and making smart lifestyle choices can help keep painful symptoms at bay so you can live your life as you see fit. To learn more about Ankylosing Spondylitis, take a look at the information we have here at to breathe. To learn more about Ankylosing Spondylitis, take a look at the information we have here at Healthline or make an appointment with your doctor. Ankylosing spondylitis (AS) is a form of arthritis that’s associated with chronic inflammation of the joints in the spine. The result is pain and stiffness in the back and hips — symptoms that tend to get worse as time passes. AS can also lead to complications such as a stooped posture, eye or bowel inflammation, and reduced lung or heart function. If you have AS, there’s a lot you can do to fight back. Proper treatment helps ease pain and stiffness, and it might also prevent or delay complications. Treatment is generally most effective when started early, before the disease causes permanent joint damage. Here’s an overview of the treatment options for AS. By working closely with your healthcare team, you can find the best combination of treatments for you. NSAIDs can help relieve inflammation, pain, and stiffness. Long-acting ones taken at night may improve sleep as well. High doses and long-acting drugs increase the chance for side effects, such as upset stomach, heartburn, or, less often, bleeding stomach ulcers or kidney disease. However, high doses may be needed to ease symptoms of the disease. When NSAIDs alone don’t provide enough relief, doctors may prescribe a corticosteroid, a potent inflammation fighter. Sometimes, a corticosteroid such as cortisone is injected into an inflamed joint for fast but temporary relief. Other times, an oral corticosteroid such as prednisone (Rayos) or prednisolone (Omnipred) is prescribed for a short time. This can help calm down a flare or get a new exercise program off to a strong start. Corticosteroids usually aren’t taken for long due to the risk of numerous side effects. These drugs — taken by injection or through an IV line — can help reduce joint pain, stiffness, and swelling. They may be effective even when NSAIDs aren’t. But like other drugs, they can have side effects. The most serious one is an increased risk for infections, especially tuberculosis. Disease-modifying antirheumatic drugs (DMARDs) aren’t considered primary treatment options for AS, but they may be used in severe cases. They target the process that sets the disease in motion. Sulfasalazine (Azulfidine) is the most commonly prescribed DMARD for AS. It may help control not only joint disease, but also the bowel inflammation that sometimes goes along with it. One rare but serious side effect is bone marrow suppression. Stronger muscles provide better support for painful joints. To perform strengthening exercises, you could use weights or weight machines. A physical therapist might also show you how to tighten and release your muscles without moving your joints so you can keep building strength even during disease flares. Stretching helps maintain joint flexibility and preserve good posture. A physical therapist can show you how to safely stretch your back even when it’s painful and stiff. In the long run, this can help ward off disability. Practicing good posture is another crucial element of treatment. In some people with AS, long-term inflammation causes bones of their spine to fuse together. Posture training may influence the pattern of fusion so that your spine doesn’t become locked into a hunched-over position. This affects not only how you look, but also how well you’re able to get around. One component of good posture is awareness. You can learn how to check your posture in a full-length mirror. Done regularly, this helps you detect any changes early and increases the potential for correction. You can also start paying closer attention to how you sit, stand, and walk. This helps you break the habit of slouching and focus on holding yourself up straight. In addition, you can do posture exercises. One of the simplest and best involves lying face-down on the floor or a firm bed for up to several minutes at a time. Applying heat or cold to the affected area may make you more comfortable. Heat helps ease pain and soreness in stiff joints and tight muscles. A warm bath or shower is often a soothing choice. Or you might try a heating pad, hot pack, or heated washcloth. Cold helps reduce swelling around inflamed joints. A cold pack can also numb a sore area when you’re in the midst of a flare. Surgery is not a primary treatment for AS. However, sometimes inflammation affects joints outside the spine. If you have joint damage to your hip or knee that’s severe enough to make it hard to get around, your doctor might recommend joint replacement surgery. Rarely, an operation called an osteotomy may be performed to straighten the spine after it has fused into a stooped position. This surgery involves cutting and realigning bones of your spine. Because it’s considered high risk, osteotomy isn’t a common option. End of Story! I hoped you enjoyed reading and learning through this article. I certainly have! You don’t really get type 1—until you get it. No other disease requires so much daily input and management from patient or caregiver. Our Glu community shares more than T1D—we share a common language and understanding. We crowd-source wisdom, share experiences, and offer perspectives—all to connect and support others living with or caring for others with type 1, while contributing to research. T1D Resources & Toolkits: Tips and Tricks from Glu and others on how to live well with type 1 diabetes. Glu Content Library: Links to more than four years worth of Glu articles on a variety of topics. Glu Events & Appearances: Where to find the Glu team offline and in person!